I’ve been wanting to make this recipe for so long that this past weekend I strong armed a bunch of friends who like to cook into having a potluck brunch. We were all iced/snowed in and what else did we have to do anyway? Finally. My casserole. After calling around to local markets during Snowmageden and shocked to find no one had baguettes (turns out this isn’t France), my neighbor and I hoofed it up to our local chain grocery. In 23 degeees. And tundra winds. He assured me this would count as my workout for the day and as with any good work out, even bought me an Irish coffee to prove it. Baguette in hypothermia-ed hand, I assembled my casserole the night before as instructed. 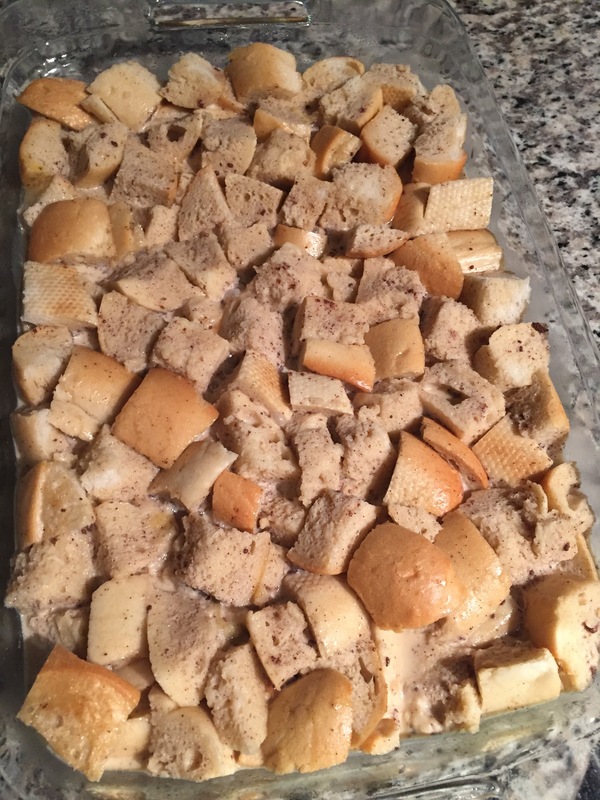 Looks like a pile of bread. It is. Don’t worry, there’s a Bourbon liquer in the custard. Because. Brunch. 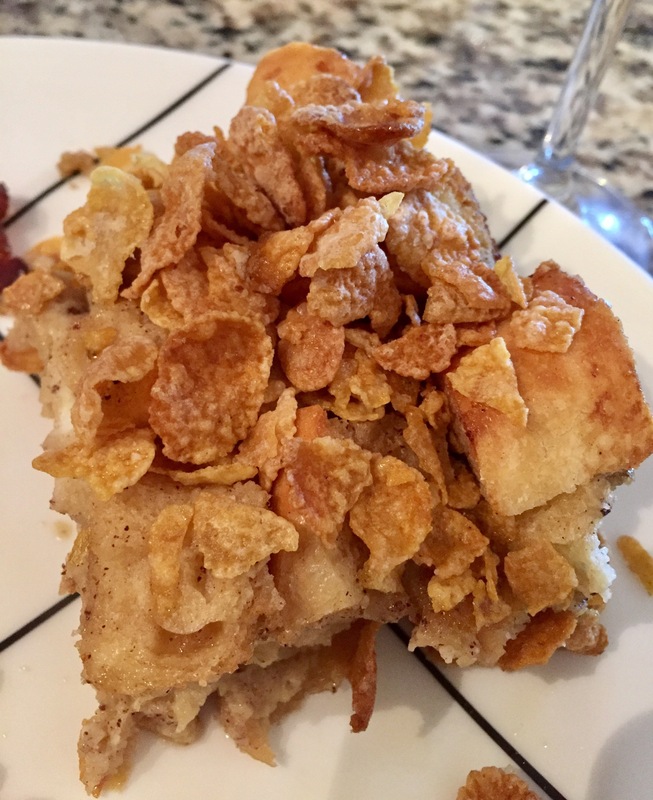 Turns out, the French toast base of the casserole tasted like anyone’s French toast casserole. So, you can just insert your French toast casserole here. Hell, add Bourbon if you want…to your casserole, your coffee, whatever. The real star of the show was the topping! Again, looks like a pile of carbs, because…it was. Your next life challenge is figuring out how to incorporate this topping into other foods. Add a crunch to your salad, some zest to your soup, or eat it with a spoon….it’s up to you! Literally, my friends were picking it off of the toast, the dish, the counter…. 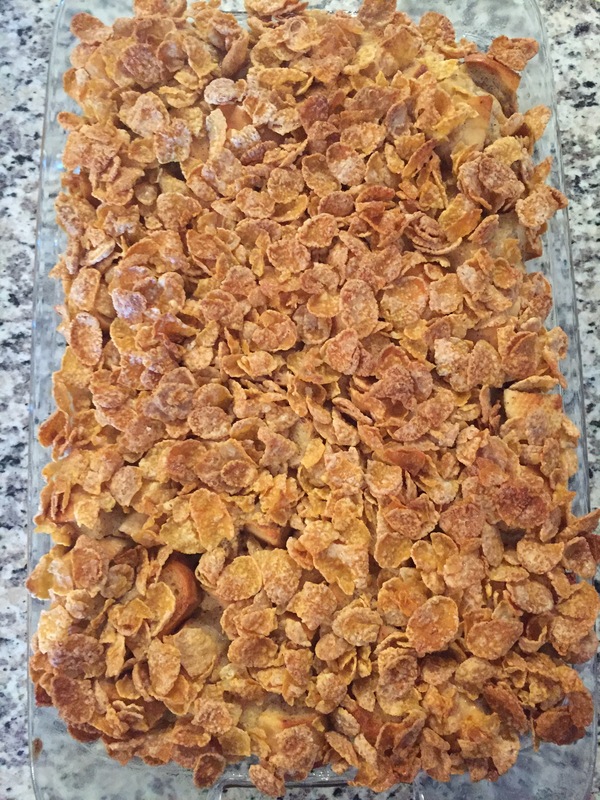 How had the Frosted Flakes folks not stolen this recipe and made it into a fat kids’ cereal already!? It’s not much to look at, but it’s better than anything you’ll find in your bedroom on a cold, winter morning, so jump on this already! (That’s what he said). Combine Frosted Flakes and salt. Gently toss with hands to coat all cereal. Gently press into tops of casseroles, pancakes, or like-minded things. Thanks! Will be demanding from Jaime immediately.